Toronto: McClelland and Stewart [0-7710-6585-X] 1973. (Trade paperback) 427, 365, 415pp. Very good. Each volume is signed and inscribed by the author. 3 volumes in very good slipcase. Photographs, illustrations, maps, bibliography, index. A previous owner's name in two of the volumes, and edgewear to the slipcase. Book about John Franklin, Samuel Hearne, Henry Hudson, Alexander MacKenzie & Fridtjof Nansen. Includes Ordeal by Ice, The Polar Passion & Tundra. Locale: North Pole. (Arctic/Polar). Mcclelland & Stewart Ltd, 1995-10-01. Paperback. Good. Toronto: McClelland and Stewart, 1977. 427, 365, 415 pp. Revised Edition - trade paperback format, presented in a slipcase. 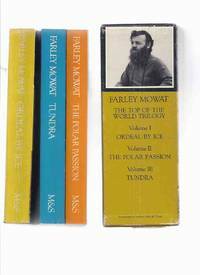 All three books have light edge and corner wear with minor creasing on the spines; no interior markings; light wear on the slipcase. Illustrated with black and white plates and maps. The Contents are: ORDEAL BY ICE: The Forerunners; The Ice Seas; Henry Hudson's Fateful Voyages; The Black Winter of Jens Munk; The Venturesome Voyage of Captain James; French Guns Amongst the Ice; The Marble Tomb; Of Whales and Ice; Winter Without End; The Vanished Ships; The Fate of Franklin; The Almost Eskimo; and The Passage West. THE POLAR PASSION: The First Steps North - The Saga of Thorgisl Orrabeinsfostri 997 A.D.; The Bay of Disbelief - The Fifth Voyage of Robert Bylot and William Baffin 1610; A Moth to the Flame - Elisha Kent Kane Arctic Explorations 1853 - 1855; Life on an Ice Floe - Charles Francis Hall Life Among the Esquivaux 1865; George Tyson Wonderful Drift 1871 - 1873; Lieutenant Greely Sees It Through - Adolphus Greely The First Crossing of Greenland 1881 - 1884; The Inland Ice - Fridtjof Nansen The First Crossing of Greenland 1888; The Passion Quickens - A Survey 1892 - 1906; Voyage to Nowhere - Robert Bartlett The Last Voyage of Karluk 1913 - 1914; and The Top of the World - Frederick Cook My Attainment of the Pole 1907 - 1908. TUNDRA: Coppermine Journey - Samuel Hearne's Expedtion to the Coppermine River 1769 - 1772; River to the North - Alexander Mackenzie Reaches the Arctic Ocean 1789; The Navy Meets the Barren Grounds - John Franklin Marches to the Sea 1819 - 1822; The Great Fish River - George Back Traverses the Barren Grounds from West to East 1833 - 1835; The Musk Ox Hunter - Frank Russell Goes Hunting with the Dog Rib Indians 1892; The Brothers Tyrrell - Exploring the Interior of Keewatin by Canoe 1893; Murder on the Tundra - The Royal North West Mounted Police Patrol to Coppermine and Bathurst Inlet 1916 - 1918; New Lands - Vilhjalmur Stefansson Discovers New Arctic Islands 1916; The Spring That Never Came - John Hornby and Edgar Christian on the Thelon River 1926 - 1927; and The Trader Speaks - Thierry Mallet's Vignettes of a Dying Land 1915 - 1929.. Later Printing. Paperback. Very Good. 8vo. Toronto, Ontario: Toronto, ON: McClelland & Stewart ( M&S ), 1973, 1st Revised Editions, First Printings for All, 1973. -----------3 volumes (ONE SHIPPING PRICE ), trade paperbacks, overseas shipping (anywhere outside of Canada and the USA ) will require additional charges, about 5.25w x 8.25h inches, all are Very Good or better copies, spine creases on Ordeal, in a Very Good slipcase with a bit of wear, 428, 415, and 365 pages, b&w photos, ---contents are as follows: ORDEAL BY ICE: The Forerunners; The Icy Seas; Henry Hudson's Fateful Voyages; Black Winter of Jens Munk; Venturesome Voyage of Captain James; French Guns Amongst the Ice; The Marble Tomb; Whales & Ice; Winter Without End; The Vanished Ships; The Fate of Franklin; The Almost Eskimo; The Passage West. .....THE POLAR PASSION: The First Steps North --- The Saga of Thorgisl Orrabeinsfostri 997 A.D.; The Bay of Disbelief --- The 5th Voyage of Robert Bylot & William Baffin 1610; A Moth to the Flame --- Elisha Kent Kane Arctic Explorations 1853 --- 1855; Life on an Ice Floe --- Charles Francis Hall Life Among the Esquimaux 1865; George Tyson Wonderful Drift 1871 --- 1873; Lieutenant Greely Sees It Through --- Adolphus Greely The First Crossing of Greenland 1881 --- 1884; Inland Ice --- Fridtjof Nansen First Crossing of Greenland 1888; The Passion Quickens --- A Survey 1892 --- 1906; Voyage to Nowhere --- Robert Bartlett The Last Voyage of Karluk 1913 --- 1914; The Top of the World --- Frederick Cook My Attainment of the Pole 1907 --- 1908. .....TUNDRA: Coppermine Journey --- Samuel Hearne's Expedtion to the Coppermine River 1769 --- 1772; River to the North --- Alexander Mackenzie Reaches the Arctic Ocean 1789; The Navy Meets the Barren Grounds --- John Franklin Marches to the Sea 1819 --- 1822; Great Fish River --- George Back Traverses the Barren Grounds from West to East 1833 --- 1835; The Musk Ox Hunter --- Frank Russell Goes Hunting with the Dog Rib Indians 1892; The Brothers Tyrrell --- Exploring the Interior of Keewatin by Canoe 1893; Murder on the Tundra --- The Royal North West Mounted Police Patrol to Coppermine & Bathurst Inlet 1916 --- 1918; New Lands - Vilhjalmur Stefansson Discovers New Arctic Islands 1916; The Spring That Never Came --- John Hornby and Edgar Christian on the Thelon River 1926 --- 1927; The Trader Speaks --- Thierry Mallet's Vignettes of a Dying Land 1915 --- 1929, any image directly beside this listing is the actual book and not a generic photo ///NOT SIGNED ---GUARANTEED to be AVAILABLE///. First Printing. Soft Cover. Very Good (see description). Illus. by Photo Cover. McClelland & Stewart, 1991. Paperback. Good. Disclaimer:A copy that has been read, but remains in clean condition. All pages are intact, and the cover is intact. The spine may show signs of wear. Pages can include limited notes and highlighting, and the copy can include previous owner inscriptions.